Atg4-dependent molecular mechanisms of the autophagy pathway. (A) Role of Atg4 isoforms in processing of LC3 family members. The four mammalian homologs of yeast Atg8 — LC3A–C, GATE-16, GABARAP, and Atg8l — are specifically cleaved by the Atg4 family of cysteine proteases, resulting in presentation of a C-terminal glycine that is conjugated to PE in the isolation membrane by a ubiquitin-like modification system involving Atg7, Atg3, and the Atg5/Atg12 complex. PE conjugation anchors LC3 proteins to the isolation membrane. Atg4 isoforms also deconjugate LC3s from the cytosolic face of the autophagosome. (B) Mechanism of autophagosome formation. Cytosolic components (e.g., cytosolic pathogens, superfluous or dysfunctional organelles, and cytotoxic protein aggregates) tagged with ubiquitin (Ub) are specifically recognized by p62, which also efficiently binds membrane-conjugated LC3, thus mediating engulfment of the target. 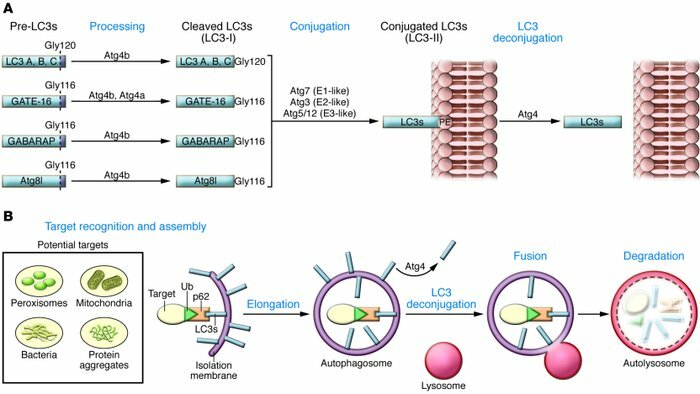 Elongation of the isolation membrane results in completion of the autophagosome and deconjugation of LC3 on the cytosolic face of the autophagosome, which ultimately fuses with an early endosome or lysosome to form an autolysosome. Acid hydrolysis leads to degradation of the contents of the autophagosome and recycling of the molecular components.